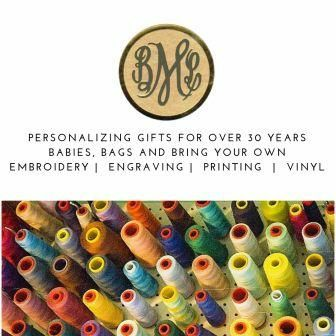 Add a monogram or name to most Bayberry products to make it your own, or make a special gift even more personal. All items that can be customized have a personalization box on the product page. Simply fill in the box with the name, monogram or other text. For initials, type them in their normal order; first, middle, last. We will arrange the letters for the style you have chosen; for monograms the last initial is in the center. We will Select the thread color that best complements the color of the item ordered unless you specify a color in the drop down menu on the product selection. We have an extensive assortment of thread colors and will do our best to match thread color to product colors. Please note that our online order system can accommodate words such as "McDonald" that require a capital letter somewhere other than the first letter. If you would like a monogram of the type, we will use the first Capital Letter of the Name. Please type the name with UPPER & lowercase letters as you would like them to appear. This is done on our leather products and is available for Monograms and Initials in fonts Block #6 (similar to New Times Roman) or Script. Soap can be order with a monogram, a single letter or name or word (up to 6 letters).